There is something about Clicker games and Idle games that just draw me in. I’m honestly not sure what it is though. Normally I like a bit more to do in my videogames, but these genres both pull me in like a moth to the flame. Lately I’ve been dragged into two of them. The first one I’m going to review is Holyday City: Reloaded (as one could obviously tell by the title of this review). For the longest time I called it Holiday City… I never noticed the halo or just thought it was like those tangerines you find at the store, but it was my wife and friend that pointed this out to me. I guess they grew tired of me calling by its’ incorrect name. What caught my eye was that it was similar to games like Adventure Capitalist and Adventure Communist and both I found enjoyable (Communist more-so), but in the end, I got kind of bored with both. I knew that was the nature of how they worked and how I usually worked with them. 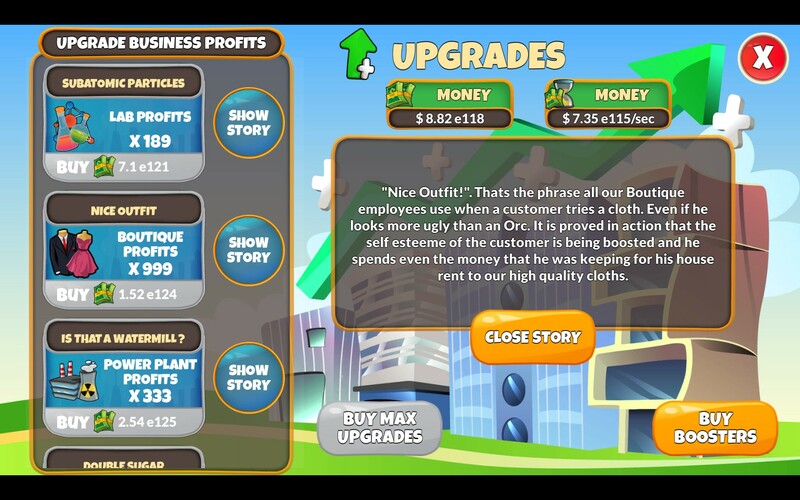 Is Holyday City: Reloaded any different? Let me break it down for you. Yes, you can give real money to this game if you want to support the developers and a boost to your game. First let me start of with the thing I don’t like about the game. I don’t like the art style they went with for the people. I cannot draw that well and couldn’t recreate said drawings or images they decided to use in the game, but it’s not my favorite. They are also everywhere in the game and you can’t escape them. I’ve spent over 120 hours on this game so it’s obviously not a deal breaker, but the over-sized-head thing just bothers me. On a positive note, that’s about it. The rest of the assets look great and creates a nice, calming atmosphere for these large-headed inhabitants. So they’ve got to be happy at least right? While interesting, I’ll freely admit that I don’t pay too much attention to the elements here that they probably put a fair bit of time into. Maybe if these windows were automatically opened at the start as opposed to having to manually open them myself I’d read more of them. There was no draw other than the initial curiosity that had me click on the “Show Story” button. Moving on down the line, the flow of the game works like I’ve experienced in other Idle games. Only this time, this is an actual Idle game. What I mean by that is that most Idle games that I’ve played are either a mix of halfsies idle and the other half(ish) is clicker based where there’s a lot of mouse-clicks involved. Now, I don’t care about needing to do that every now and then, but when something is called an Idle game, I kind of expect 90-ish plus percent of the game to be done so while I idle or fiddle with the many intricacies of the math amplifiers of the game. There are plenty of things to help you reach your goal of… getting all of the achievements or building the best island (nah, we all know it’s the cheeves). All of the extra options here are so straight forward a drunk could walk on them without fail. 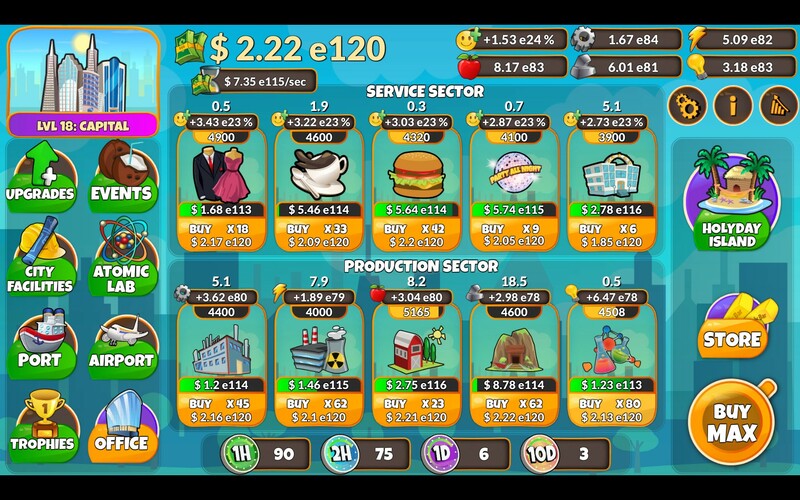 Everything is “x3” or “x300” and they just add up.There’s no, “hmmm… that options sounds good” and the game has you spend a good amount of resources and gives you a measly .00023 boost. (Only 5000 more levels to go to max the bonus out!) That I appreciate. 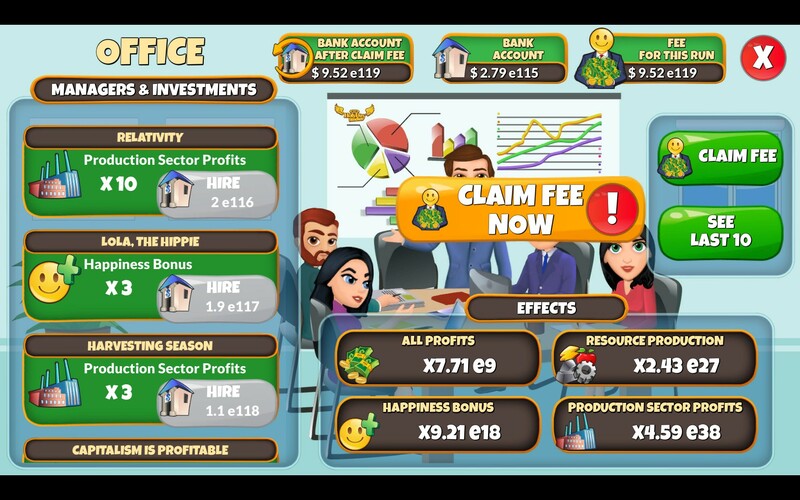 I would venture to say that the devs of Holyday City: Reloaded were trying to make this as accessible/user-friendly/welcoming as they possibly could and I think they nailed it. 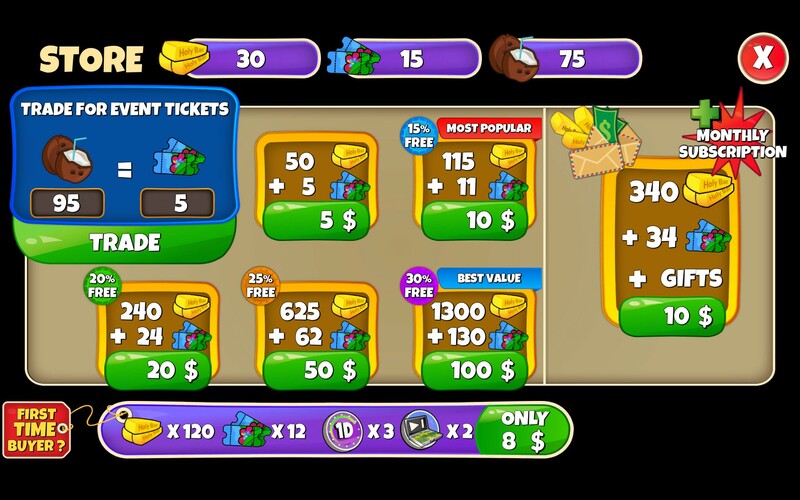 Moving forward, because basic “on the main-screen options” are boring, there are other parts of the game that help with the money-grabbing (because everything costs something here). You’ve got resources that you will get as you level some places up that can be used to trade in said resources for straight money to buy up more services. 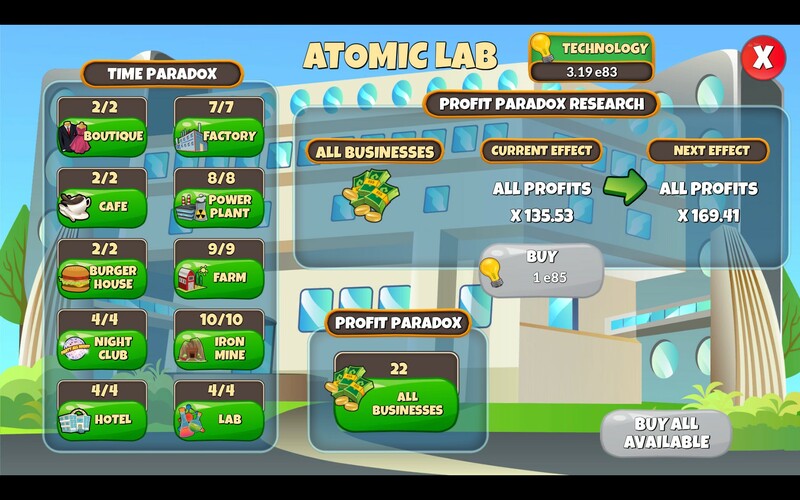 Eventually you’ll get an air port that you can trade certain resources for others like the research credits to then spend on making things work faster to get money quicker. There are quick and easy daily log-in bonuses. There is also a mini-game that they change every now and then that you can use a few times a day given the tokens you’ve collected (which you get quicker if you stay logged-in). After you’ve bought everything, there’s more stuff to buy! You thought you got it all? You were wrong suckah! Have I reached my limit with the game already with my 120+ hours of gameplay achieved? That depends on how you look at it. Sure, when I first downloaded the title I turned it on more and left it on for the “staying logged-in” bonus and I don’t do that anymore. I got to a point where I unlocked the marina. Before I got to this point, I would do a hard-flip (start over from scratch with some bonuses to profit to get farther than I did last time) every chance I could get a bonus. Once I got to the marina the game offered me a different timer of sorts. Every 4/8/12 hours I could get pearls that I could then use to purchase significant buffs to my money-making machine. We’re talking 100’s of percent here! After a certain point (and where I still find myself) I now log in to get my daily bonuses and make sure that I get my pearls and send my boats to get more and in twelve hours I’ll be back. You don’t get exponentially more pearls for doing the longer run, but since the longer run has me doing less work I opt for that. Now I don’t flip the game unless I’ve gotten past at least six to seven upgrades instead of the initial one I used to do. This may change when I unlock the “Holyday Island” and find out whatever magical “draw me in more often” techniques they may have there for me, but I feel that may be a long ways off. My kids complain that I haven’t gotten there yet, but they are three and five and I’m a patient man. The hard-flip here is called claiming the fee. Picking up these permanent bonuses is how you’ll get to the end-game. If you’ve got the stamina. Maybe the Marina with its’ ship missions for pearls was implemented a little funny and got me to log in less, but I still log in twice daily to continue my progress. Holyday City: Reloaded is super straight forward. There are a lot of different facets to the game to be sure, but they are all simple and easy to wrap your head around. It’s a nice change of pace from some of the Idle games I’ve played that will have you searching for guides on-line to figure how to make progress because you’ve hit a wall and nothing is very telling. The music is pleasant (yes you can mute it), the mechanics work, the game gives me a desire to come back and check on it and the aesthetics are relaxing (and make a good home for all of the bobble-head people who inhabit the island). I would give Holyday City: Reloaded a try if you like the Idle genre or are new and want to try this type of game out! ← (Review) A Robot Named Fight!